At Newark Orchard our pupils take part in a range of activities which enrich their experiences alongside the curriculum. Please take a look at some examples of this below. We have had a good year in the allotment, this has been the first time we have been able to plant up all our raised beds. We have had a good harvest, being able to sell potatoes, garlic, onions, beans, and rhubarb, to name just a few things. 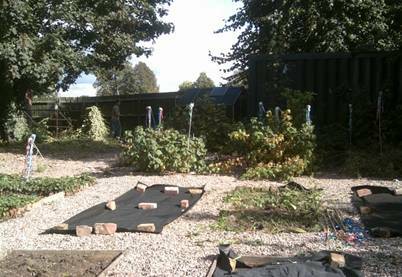 The students and horticulture staff have also managed to grow and sell tomato and cucumber plants. All money that has been raised has been used to buy items, plants and seeds to grow for next year. Let’s hope we have as good a year next year as we have had this year. Click here to see photos of us planting flowers in Coronation Street park, after school dance club, painting posts by Balderton lake and handling animals on our Animal day. Tara is trained as a Pet Therapy Dog and visits the classes on our Lower Site. She provides comfort, encourages positive social behaviour, enhances self-esteem, motivates speech and inspires our pupils to enjoy their learning. Tara is taken into classrooms by Debbie, she is kept on a lead at all times, under the control of Debbie. Our pupils know how much Tara enjoys hearing stories and she will read with some of our pupils, they sit close so they can interact with her. Some pupils will share the pictures with Tara and explain what is happening. This is an excellent strategy for using with our more reluctant readers. Travel Independence Training Across the Nation is a scheme which has been designed to encourage young people to become safe and independent travellers and give them improved life skills. It is based on a traffic light system and consists of assessed tasks which have to be completed to move on to the next level. At Newark Orchard School we have a trained member of staff who leads on this across the whole school. A tailor made package is planned for individual pupils to take part and is designed around their needs. The aim of this is to increase independence and build confidence in travelling. National research also suggests that this has a positive impact on reducing road accidents, improves social life and improves job prospects. The traffic light system means that pupils can begin on tasks such as finding their way around school to then progress to finding their way safely around the local community and then to using public transport independently. As this scheme is progressive it allows for young people’s achievements to be recognised at each level. Some of our pupils achieve the ultimate aim of travelling independently to their residential trip to Butlins at the end of their time in school. At Newark Orchard we have a member of staff who supports individual pupils who are working on our Explorers Pathway to access their learning through sensory experiences. This allows them to work on individual targets in an environment which is conducive to their learning style. The pupils thoroughly enjoy their sessions and respond well to this multi sensory approach. The member of staff who delivers the sessions is very experienced and has been involved in training other professionals from local schools.